A small or secondary umbel. 1. A natural brown earth containing ferric oxide and manganese oxides, used as pigment. 2. Any of the shades of brown produced by umber in its various states. 1. A dark area, especially the blackest part of a shadow caused by light from all points of a source being prevented from reaching the area, usually by an opaque object. 2. In astronomy, the shadow region over an area of the earth where a solar eclipse is total. 3. The darkest region of a sunspot. 4. A shade; such as, a ghost. The act or quality of providing shade. Shade or shadow; a shady place. 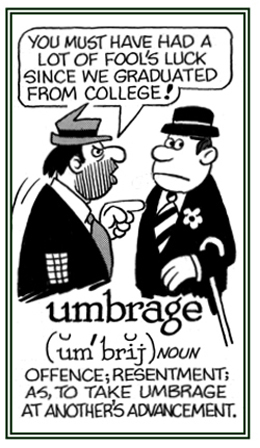 This Latin stem is employed in botanical adjectives; such as with, umbraculiferous and umbraculiform. Bearing an umbrella-like organ or structure. 1. An umbrella or an umbrella-like structure. 2. Any umbrella-like sturcture; pigmented fringe of iris, in certain ungulates; pupillary appendage, in amphibians. Umbrae enim trausitus est tempus nostrum. 1. Offense, resentment; annoyance; displeasure: Professors and students took umbrage at the implication that colleges are filling their heads mostly with trivia. The expression take umbrage or "take offence" arises from a metaphorical extension of "shadow" to "suspicion", which took place in French. 2. The slightest indication or vaguest feeling of suspicion, doubt, hostility, or the like: When Susan’s husband called up and said that he had to work late at the office again, she took umbrage and was very disturbed because she suspected that another woman was involved in his repeated delays in arriving home. 3. 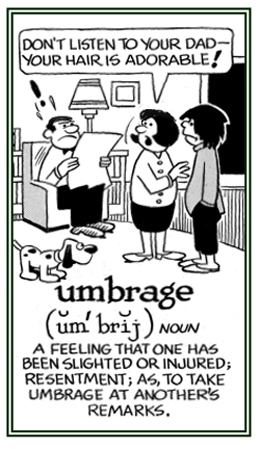 Something that provides shade or a shadow: There are leaves that provide umbrage; such as, the foliage of trees. 4. A vague or shadowy shape or simply an indication; a hint: Shirley had an umbrage, or an inkling, that Steven was going to ask her to marry him because she saw that he had a small present for her which he had bought at a jewelry store. 5. A shadowy appearance of something: When looking out of the living room window that night, Alice thought she saw an umbrage of a man emerge from behind the bushes next to the garage. © ALL rights are reserved.